I’d like to apologize to the people of Greece. I’ve been pretty hard on them over the years. I’ve made fun of their freewheeling spendthrift habits, their unwillingness to pay their taxes, and their early retirement ethos. When they were given membership in the Euro zone, I made fun of that too, or at least of the rest of Europe’s willingness to cast its lot with the Greeks. “That’s like going mountain climbing with your safety rope tied to the town drunk,” I said. Image via desbyrne @ Flickr. Nor did I let up when the Greek economy went blooey and was forced to go, worry beads in hand, to Europe’s banks and ask for a bailout. “You might as well contribute to Bernie Madoff’s Defense Fund,” I said. Not that what I said was factually wrong, but it was insensitive to the people who invented democracy and whom we’ve treated shabbily. Because, while the Greeks got their bailout five years ago, it was attached to draconian conditions that made it virtually impossible for the country to pay off its debts — ever. Europe, led by Germany, demanded that Greece cut its pensions. It did. Then it ordered the Greek government to raise taxes. It did. It told Greece to brutally cut government employment as a way of returning to prosperity. The Greek government did all of that for four grinding years and prosperity never came calling. It had lost Greece’s telephone number. Unemployment spiked to 25 percent and youth unemployment was twice that. Finally the Greek people got fed up. They threw out the conservative government that was meekly acceding to austerity demands in favor of leftist leaders who refused to let other European powers — particularly Germany — push them around anymore. We’re mad as hell and we’re not going to take it anymore, Prime Minister Alexis Tsipras said, in effect. We want our loans restructured. We want freedom to breathe. No dice, replied the other Europeans. We have rules — you have to abide by them. The Greeks said no, the rest of Europe said yes. The Greeks said no, the rest of Europe said yes. It went on that way for weeks with the Greece situation becoming more desperate by the day. Finally, the parties reached a preliminary agreement that promises to be even more debilitating to Greece than the original plan. We should have seen it coming decades ago. Greece and Germany don’t belong on the same continent, let alone in the same currency union. These people don’t understand each other and never will. 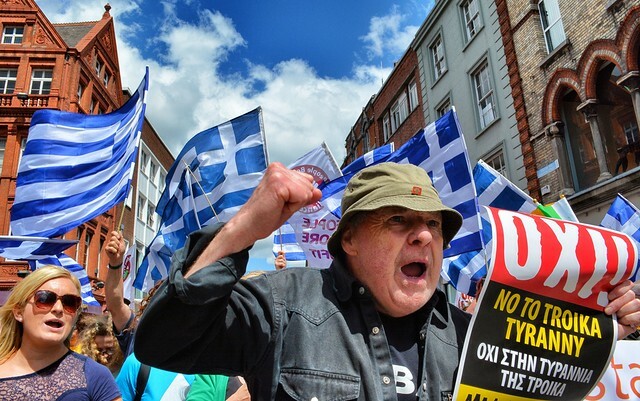 European powers like Germany are ticked off at Greece for its irresponsibility. But the Greeks have been trying lately. They’ve donned the hair shirt of austerity and what has it got them? Economic collapse. Nor does it look as though it’s going to improve any time soon, certainly not under the proposed agreement. What European leaders don’t understand — and neither does our Republican Party for that matter — is that in hard times, you can’t cut your way to prosperity. Cut fat and waste, certainly. Reform the tax structure by all means. But when times are hard you need government to provide economic stimulus to grow your way to prosperity. And what would be wrong in requiring the banks that made bad loans to share in the pain of repaying them? Not the capitalist way, I guess.